lexxxrosen - Vermont Sound diminishing "Does not block entirety of sound, yet has decibel killing power. Not left with ringing ears anymore. Great fit and comfort." Steve Does as advertised "There great plugs, the muffle most noise but mostly engine, hard to describe but you almost can hear everything else better but quieter still. 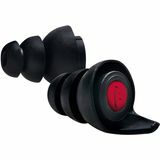 Comfy fit and easy to put in and take out but if you put them in not perfectly they get loose and don't muffle anymore."